Why Should I Buy a Folding Rollator? Rollators can help you stay active even with limited mobility, whether you’re frail, elderly, or temporarily recovering from illness or injury. If you’re thinking about purchasing a rollator to help you get around town, you may want to consider purchasing a portable option that you can take with you wherever you go. Folding rollators offer the same benefits as regular rollators, supporting you with stable, wheeled legs that can help you to walk without overexerting yourself. Like many standard rollators, you can also find folding rollators that offer seating when fully assembled. Unlike other rollators, however, a folding rollator can be easily deconstructed into a compact form that’s easy to transport and store when not in use. Whether you’re at home or on the go, a folding rollator walker can help you to move around with ease. Even if you suffer from mobility impairments, you can still maintain an active and independent lifestyle. What Should I Look for in a Folding Rollator? If you are thinking about purchasing a folding rollator, it’s important to ask yourself what you want from a mobility aid. Depending on your unique needs, there are a few features to look for in a good portable rollator. The width of the rollator. If you plan to use your rollator indoors, you should make sure that it is narrow enough to fit through doorways when unfolded. The weight of the rollator. Your rollator should not be too heavy to push or carry without straining yourself. The wheel size. Even with a lightweight frame, wheels that are too small can throw a rollator off balance. Bigger wheels can better support your weight as you move and act as shock absorbers that add a degree of cushioning to your ride. The stability of the rollator. Before purchasing a rollator, you should make sure that it is able to adjust to your height and support your weight. Four-wheeled rollators tend to be more stable than those with three wheels. Built-in seating. While a padded seat isn’t absolutely necessary, it’s nice to have to option to sit and rest when needed. Foldable rollators often have seats that are adjustable or removable. Storage capacity. A detachable basket or compartment on your rollator can help you to carry around personal items without overloading yourself, and it won’t get in the way of folding your rollator. 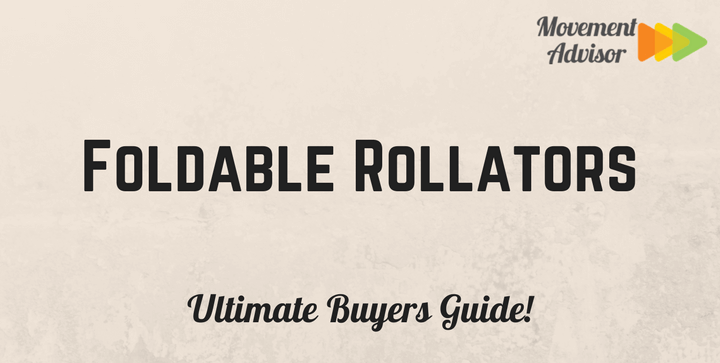 There are an overwhelming number of choices available when it comes to folding rollators, and it can be difficult to decide which model is best for you. We recommend the following walkers for their price, durability, and portability. This Drive Medical Foldable Rollator is a well-constructed and durable mobility aid option, featuring a sturdy steel frame in red or blue and a comfortable padded seat, not to mention an adjustable backrest and a handy storage basket. When folded, the whole assembly can fit neatly in a trunk, closet, or other small space. A simple brass push-button release system makes it easy to set the rollator up whenever and wherever you want. The model’s oversized 7.5” caster wheels are able to handle all types of terrain, offering a smooth ride in both indoor and outdoor settings. The loop lock brake system is easy to use and helps to ensure that the rollator won’t move or slip when you’re seated. This rollator is adjustable to accommodate individuals of different heights. Depending on your size, you can set the handlebars between 31” and 37” to give yourself a more comfortable ride. The product is on the heavier side, at 20 lbs., but it can support up to 300 lbs. in weight. This foldable roller is a little bit more expensive than our other picks, but its stylish and lightweight red frame makes it a popular choice for people on the go. The Drive Medical Nitro Euro Style Rollator even comes with an attractive storage bag that holds the rollator when it is folded to its ultra-compact size. Despite having four 10” wheels, the Nitro rollator boasts impressive maneuverability. A caster fork design helps to improve the device’s turning radius and makes it easier to move in any direction. The brake system is easy to use, with the brake cables tucked inside the device’s handlebars to prevent snags and improve safety. This rollator is a standard size, with a handlebar that can be adjusted between 33.5” and 38.25” in height. Although its frame is relatively lightweight, the rollator can support individuals weighing up to 300 lbs. The Medline Aluminum Folding Rollator weighs just 17 lbs, but it can support the same 300 lbs as many competing models. The rollator is also adjustable, with a handle height of anywhere between 32.5” and 37.5”. When you want to transport your rollator, this model folds flat for easy carrying and storage. Medline’s folding rollator is not only versatile, but also comfortable. It features a fully padded seat and a thick backrest that offers support while you sit and rest. The device’s large, 8” wheels act as shock absorbers to provide a smooth and seamless ride. If you have anything to carry with you as you travel, you can stick it in this rollator’s mesh storage basket. You can transport anything from your purse to your groceries without having to worry about juggling heavy bags. The HealthSmart Euro Style Rollator is easy to assemble and easy to fold up into a compact 25” X 16.5” X 11.25” conformation in just minutes. The device comes complete with its own storage tote and cane holder, making it easy for you to bring all of your walking aids with you wherever you go. When unfolded, the Euro Style rollator has an adjustable handle that can be set at between 31” and 36” in height. The frame is composed of aluminum, making it lightweight and strong, and is capable of supporting up to 300 lbs. It comes in three attractive colors, including black, titanium, or purple. This rollator has oversized wheels that offer an even ride across all terrains, from concrete to gravel to grass. The front wheels measure 8”, while the rear wheels are a smaller 7” to provide superior maneuverability without sacrificing ride quality. The Portable Rollator Walker by Hugo Mobility is built for comfort, featuring a padded seat, a backrest, and oversized 8” wheels. The model’s underseat storage bag eliminates the risk of losing small items that traditional mesh baskets pose, giving you a worry-free way to transport your valuables. This rollator’s handlebars are completely adjustable, reaching between 33” and 39” in height to accommodate people of nearly any height, including tall individuals. Built-in ergonomic grips not only make steering more comfortable, but also make it easier to reach the device’s brake system without straining your hands. This can be a particularly attractive feature for individuals with arthritis, carpal tunnel, or other hand issues. When you want to leave the house, it’s easy to take this rollator along with you. It folds up and reassembles without any tools, allowing you to use your rollator in almost any space or situation. Its small size also makes it light and easy to carry while still boasting the ability to support the standard 300 lbs.